Crab cakes with a spring salsa… recipe and pairings. 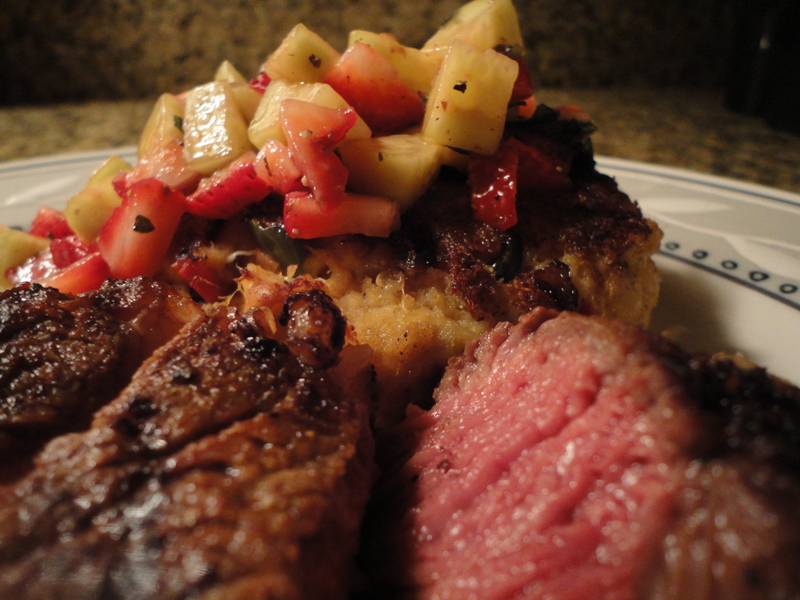 So I was craving a little surf and turf last night and decided to make a grilled ribeye and crab cakes. For a twist, and to offset the richness of the thickly marbled ribeye and the crab cakes, I made what I call a spring salsa, which has strawberry, cucumber and mint. Below is the recipe for the crab cake and salsa, as well as some wine pairings. However, keep in mind that the pairings are geared towards the cakes and salsa by themselves. If you are using them to accompany other items, such as my steak last night, that will most likely change the ideal wine pairings. First thing to do is make the salsa so it has a chance to rest in the fridge and start to sweat. Simply combine all of the ingredients in a bowl, cover with plastic wrap and put it in the fridge. The strawberry and cucumber will start to release juices which will give the salsa a more pronounced flavor. Allow the salsa to rest in the fridge for at least 90 minutes, stirring it every 30 minutes or so. Now onto the crab cakes. Simply combine all of the ingredients (minus the olive oil) in a large bowl, stirring everything together thoroughly. Cover with plastic wrap and allow to rest in the fridge for 30 minutes. This gives the panko time to soak in some of the moisture from the crab and mayonnaise for better texture and flavor. Separate the crab mixture into six equal portions and roll into balls, Press down lightly on the balls to form a cake shape, press in lightly on the sides to smooth any breaks and strengthen the integrity of the cake. Heat your oil at medium high in a sauté pan. You want your pan hot so the cakes don’t absorb too much oil, but you don’t want it too hot or the panko will immediately burn. Sauté the cakes until golden brown then flip and repeat. Once both sides are browned put the cakes in the oven for 10 minutes to finish. Once they’re out of the oven plate ’em up, top them with the spring salsa and enjoy! So let’s talk wine pairings. Remember what I said above, these recommended pairings are based solely on the crab cakes and salsa. If you’re having them with something else then it could very easily change what the ideal pairing would be. For instance, I had mine with a heavily marbled steak glazed with sriracha. With the varying flavor profiles on the plate my ideal pairing was a Russian River Zinfandel by Limerick Lane. BUT, if I was just having the cakes and salsa that would not have been the direction I went. 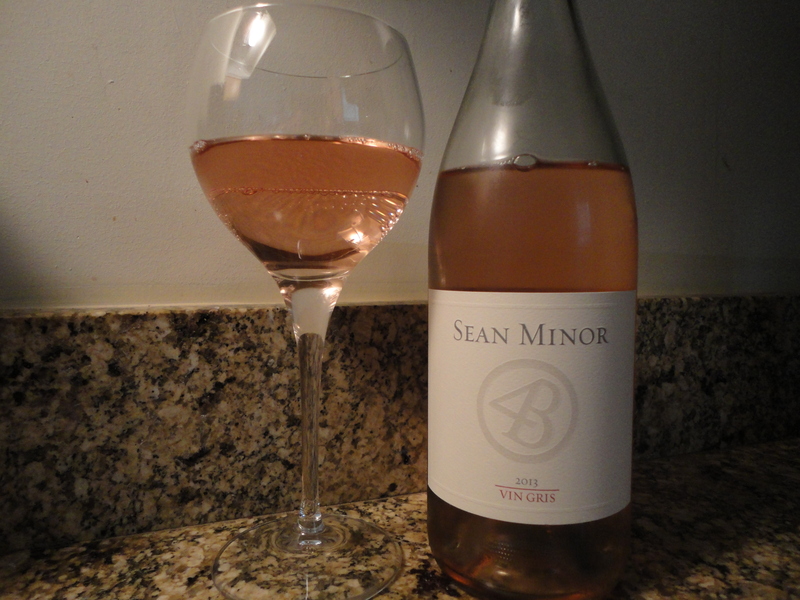 Ideally what you want here is a white, red or rose with light to medium body that has a good blend of fruit and acidity, with little to no oak presence on the palate. The things that immediately pop into my mind are Vin Gris, Fiano, Gewurtztraminer, Torrontes, Frappato, and Gamay. So there you have it, my recipe and my wine pairings. I hope you give it all a shot, give me a shout if you do. More new content will be going up shortly. In the meantime, crack open a bottle of Vin Gris, Torrontes or Frappato, sit back, and relax. Life is short, enjoy it! Tags: crab cake, strawberry salsa. Bookmark the permalink. Made the crab cakes tonight… They were a hit! Delicious!!! Awesome, great to hear! Thanks for sharing.